Most everyone realizes that the saxophone is the coolest instrument on this particular planet. 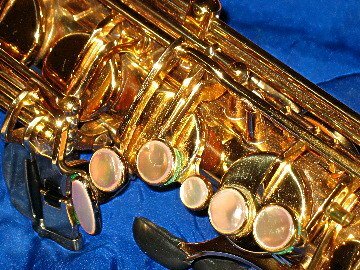 Many topics and issues surround the sax, as well as music education in general. The sax can be found in most band ensembles, some rock groups, and once in a while the orchestra. The saxophone should not be treated as the clarinet's inferior cousin. Nor should it be pigeon holed as just a popular music instrument. It's more than that. In this day of school budget cuts, many general music and vocal teachers are given extra duty as band director. Tips, advice, and techniques are wanted by these music professionals. And the opposite is true as well; the band director must now become the school general music teacher. The lines separating these specialists are being erased. Some instruments are into a world all themselves. A few people agree this is the same for the saxophone. I don't agree. It must belong to a larger world than that. And it is becoming more so all the time! This website is visited each day by people from all over the world. And I want to personally thank each of you for your interest. The saxophone is an instrument that truly belongs to the whole world! So come on in to my site and be a part of the funnest instrument to play in the world!